Warren County Technical School students in the Law and Public Safety program hosted their annual Veterans Day Celebration on Friday, November 17, 2017. The event featured 30 veterans who served in various capacities and represented each branch of the armed services, including two Purple Heart Recipients. The honored guests included military service members ranging from Active Duty service men and women to veterans who served in the 1940's and each decade in between. The event was coordinated by students in the Law & Public Safety (L&PS) program and advised by L&PS Teacher Robert Wheatley. The event was designed to pay tribute to all Veterans. 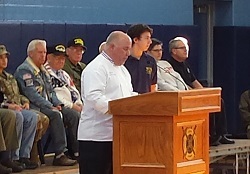 The Key Note Speaker for the event was Patrick Lilly, who served in the Air Force from 1988 - 2011 and is currently a teacher at Warren Tech in Culinary Arts. 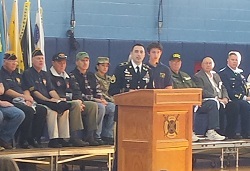 Mr. Lilly spoke with the students about the military and the values it teaches you. The ceremony concluded with the awarding of a Certificate of Appreciation from the Marines to Mr. Wheatley and Warren Tech Principal Geta Vogel, in recognition of the school’s support of the military. Following the ceremony, the veterans visited various classrooms throughout the school to speak with students about their military service.